An intriguing signal reported at the LHC might signal some “cracks” in the Standard Model – the theory which describes how different forces interact with each other. 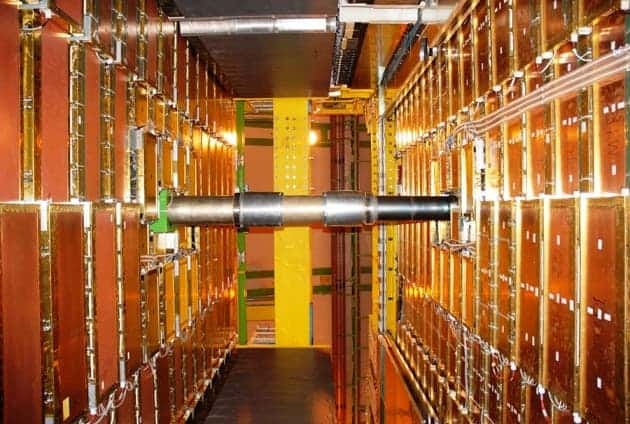 A view inside the LHCb experiment’s muon detector at the Large Hadron Collider. Image credits: CERN. The LHC has already accumulated a trove of valuable data, and researchers are still working on analyzing it. Now, a study on data gathered during 2011–12 at the collider at CERN suggests that in some particular decays, some short lived particles (B-mesons) create some particles (taus) more than others (muons); but according to the Standard Model, the decay should be happening at the same rate, so something is clearly not as expected. Let’s explain that a bit. Quarks are elementary particles – they’re the smallest thing we know of, the very basis of subatomic particles. Hadrons are composite particles made of quarks. Mesons are a specific type of hadrons made from one quark and one anti-quark – and B-mesons are a type of mesons. They are very short lived, so studying their decay is particularly difficult. The discrepancy that was observed is so small we can’t rule out a statistical fluctuation (a satisfying statistical threshold has not yet been reported). But physicists are excited because a similar thing has been reported at two other experiments: the ‘BaBar’ experiment at the SLAC National Accelerator Laboratory in Menlo Park, California, which reported it in 2012, and the ‘Belle’ experiment at Japan’s High Energy Accelerator Research Organization (KEK) in Tsukuba, which reported its latest results at a conference in May. LHCb’s result is “bang on” the previous two. as Mitesh Patel, a physicist at Imperial College London who works on the experiment, explained. The “2-sigma” difference is an indicator of accuracyused in control charts. When comparing 2 sigma vs 3 sigma control charts, 3 sigma control charts help ensure process stability whereas 2 sigma control charts are used to detect small shifts in the project or process. For such discoveries, 5 sigma is usually required, while this discovery only has 2.1 sigma. But as Patel said, a series of 2 sigma is worth much more than just one, isolated event. Since the 1970s, experiments have time and again proved the accuracy of the standard model – with surprising consistency. However, the Standard Model is incomplete at best, and quite possibly inexact as well. Its failure to account for gravity and dark matter seems to suggest that it’s merely an approximation of some other, underlying and even more intriguing truth. The finding will be published in Physical Review Letters this month (it’s already published on the arXiv pre-print server).